If you're new to the concept of newborn photography, you might not know that most photographers think the ideal times for photographing a newborn are between day 5 and 14 (give or take a few days). While I agree with this time frame, I wouldn't turn someone away for contacting me a few days late...I mean, new parents already have quite a lot on their plates! Stacey contacted me after she and her husband Benji welcomed beautiful Cora to the world. With the craziness surrounding the holidays, we were unable to make the shoot happen until Cora was about 6 weeks old. While we weren't able to get some of the sleepy, squishy newborn shots I usually aim for, we were able to get tons of images of baby Cora that might not be as doable with a super new baby. First we did the family portion of the session at a gorgeous nearby park. It was an unseasonably warm November day, so baby Cora stayed nice and comfy cozy throughout. We worked with the natural surroundings and got some great images capturing the love in this family, not forgetting adorable pup Sierra! Then we headed back home for the newborn portion of the session. Cora was an absolute rock star, just like her mom and dad! Isn't that sweet smile enough to melt your heart? I just love this smirk! Since Cora was a little bit older for her shoot, we got a lot of great shots of her looking right at the camera! I love utilizing design in the clients' home, like this beautiful rug in Cora's nursery. 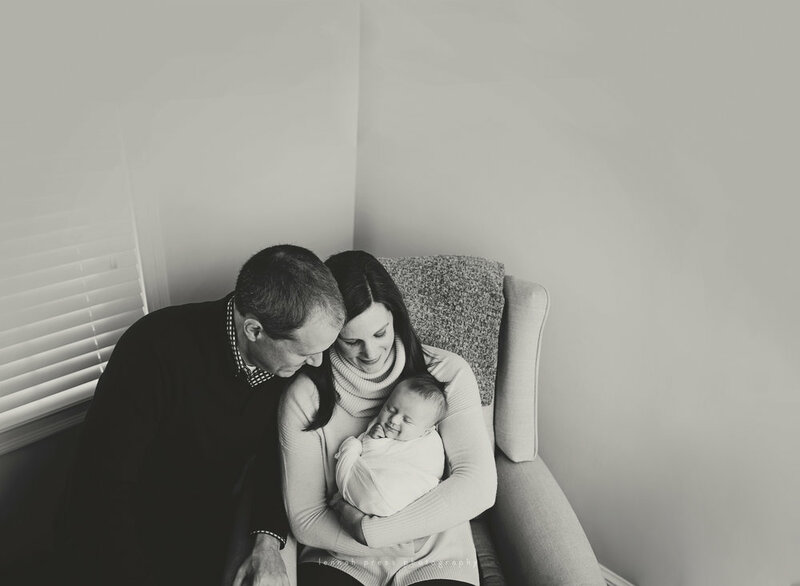 When I go into a client’s home for a newborn session, my top three objectives are to capture the family connection, their personalities, and life as it is that very day. Those days right after the birth of a new little baby seem to fly by, which is why I think that newborn photography is so important. Sure, in that moment you’re exhausted, probably pretty sore and banged up, and not exactly in the mood to get the whole family dressed up and smiling for photos. But I know from my own experience that those are the images that I treasure the most. I look back now at images of my children as newborns and can see their personalities as I know them now, shining through even then. So back to personality! I met Giana (mama to Ari and Adam) through my hospital’s new moms group, her daughter has grown up alongside my son. Knowing her family, I knew there would be no shortage of personality with this clan. And I was not disappointed. Enjoy a few of my favorites from this great session!